Perhaps you have never seen or eaten fava beans (also called broad) let alone have had them for breakfast. But in the Mediterranean region fava beans are a staple for all meals throughout the day. I’ve chosen breakfast today, simply because I had a bumper crop this year and have them ready in the refrigerator. Frozen favas can be found at your local supermarket or try your farmer’s market for fresh beans from March through June. Other ingredients can be added such as a fresh tomato, peppers, green onions or celery. For more fava recipes look here. Fresh fava beans make a healthful addition to your morning egg dish. 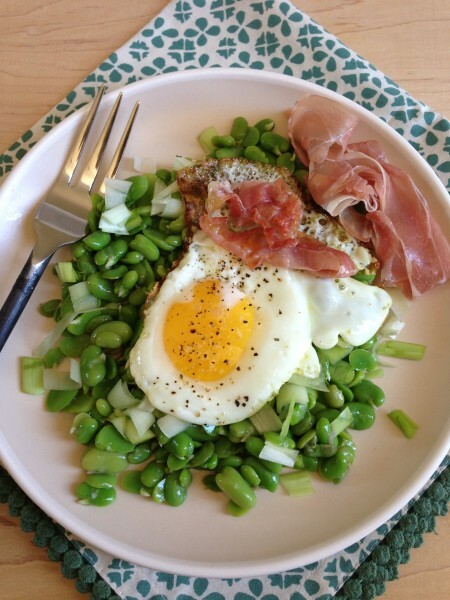 Create a quick and easy dinner with frozen favas and eggs for your next dinner. Heat a saute pan with 1 teaspoon of olive oil. Add the fava beans, leeks, prosciutto and salt and pepper and saute until almost softened. Reduce the heat to low, and make two small wells in the beans. Crack two eggs in each well, sprinkle with salt and pepper. Cover and cook until eggs are cooked to your taste. Recipe can be doubled. If favas are not in your area, add a small cooked white bean. Favas in my garden as a whole bean. Mary this looks like a great new take on eggs for breakfast – extra flavor for sure! I love this idea! And those fava beans from your garden were truly exceptional. I wish I had your green thumb. Thanks Laura,the favas came in all at once in my garden and this is an easy addition to any egg dish! Thank-you Lisa, favas can be found at your farmers market until June. try them mashed on toast for a healthful appetizer.